The production of chocolate involves many different complex steps. Even the fertilisation of the flower to produce the cocoa bean is a complicated process; only 1% of each tree’s 6000 flowers will develop into a cocoa pod. Each cocoa pod is around 15-30cm long and is yellow or red in colour. 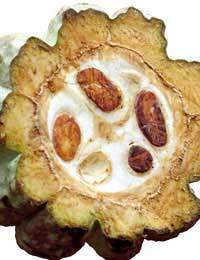 The fruits contain 25 to 50 seeds, which we know as the cocoa beans. After the creamy-coloured seeds have been removed from the pods, they are fermented in trays or heaps on the ground (sometimes they are covered in banana leaves). It is during fermentation that the beans turn brown and develop their distinctive flavour. The beans are dried, and then shipped to chocolate production factories where they are cleaned, hulled and then roasted. Roasting the beans helps make the separation of the shells and nibs easier. After the shells have been removed, the clean, cool nibs are refined. The nibs are blended in a similar way to coffee beans, to produce different colours and flavours. They are ground under rotating stones, discs, or rollers. The result is chocolate liqueur, a liquid that is more than 50 percent fat (cocoa butter). The chocolate liqueur is then mixed with the desired amount of ingredients such as sugar and milk solids (for milk chocolate). These ingredients are thoroughly blended and then conveyed to large refiners, which crush the mixture to create a smooth chocolate texture. Conching involves heating the chocolate at high temperatures (54 –71C /130 –160ºF) and stirring it continually to form a pure, homogeneous liquid. At the same time, the mixture is exposed to a blast of fresh air. During conching, chemical changes occur that develop the chocolate's flavour. Additional flavourings, such as vanilla add a final hint of flavour. It is at this stage that other additives, such as lecithin (an emulsifier derived from the soybean) are added. Lecithin establishes the precise consistency necessary for using chocolate to make moulds (such as Easter eggs) or coatings. After conching, the chocolate is moved to tempering machines where it is poured into metal moulds or blocks. The filled moulds must then pass over a vibrating table to eliminate any air bubbles in the chocolate. The quality of the chocolate is based on the quality of the cocoa beans used and the conching process. There are three key things chocolatiers need to get right when creating a luxury chocolate: quality of the ingredients, the blending technique and the filling. The cocoa beans should be of exceptional quality, ideally from a crop growing very close to the Equator (where temperature and humidity conditions tend to make the most flavoursome beans). The chocolate needs to be carefully blended (conched) to give a smooth, rich taste and melt-in-the-mouth consistency. If a filling is used, it should be delicate and light, but rich enough to compliment the chocolate flavour. From the harvesting to the blending, conching and preparing, chocolate preparation is a delicate and often tricky process. The quality, flavour and texture of the chocolate can depend on a variety of factors, from right back to the harvesting process up to the quantity of chocolate liqueur in the final product.